We often work with organizations adding capacity, transferring new products, and adding existing products from other sites into their “preferred” plants. These facilities range from CMOs to traditional name-brand pharmaceutical companies. In each case, the receiving site is focused on schedule and budget. These competing targets have often distracted personnel from understanding and embracing newer technologies, thereby bypassing lower-cost options and faster project implementation. The following discussion covers actual cases of aseptic fill sites in the U.S. and their new projects. With this as a basis, we often see a 2019 project looking more like a 1995 project. In an effort to make sure the plant can operate the new line and to not deviate from something they are familiar with, they look for a linearized serial arrangement of equipment. This linear physical arrangement makes the project photos look good in the company’s annual report but does little for the organization. To linearize any production forces the equipment positioning into an architectural nightmare by penetrating through building spaces and interstitial overhead space. This virtually guarantees the production line and its classified areas and clean unclassified areas occupy the maximum space on the operational floor, which is the most valuable real estate on the site. The number of airlocks, prep space, restricted access barrier systems (RABSs), or isolator space within the classified area typically costs $1,000 per square foot for construction for the EU grade B space (if you use a RABS) or $800 per square foot if you use an isolator sitting in EU grade C space. This is not the full spectrum of the cost, however, as the electrical operating cost for grade B space is about $166 per square foot per year and the grade C space is about $136 per square foot per year. Add to these operating costs about $110 per square foot per year for heating/re-heating in natural gas costs (mid-Atlantic U.S.). These are all air-handling and space-conditioning costs. The goal should be to consolidate, and possibly engineer, your line into a U shape or an L shape or cut the line size down to the most space-efficient configuration possible. This may be the easiest way to become the cost hero in your company. Use CNC (controlled not classified) space as much as possible — $250 per square foot construction cost, $20 to $40 per square foot per year for operating power, and $40 per square foot per year for gas heating. This can be accomplished by moving out support functions and storage out of the classified area. Reduce your footprint and eliminate tunnels, vial washers, stopper washers, and cap washers. Use RTU (ready-to-use) components to shrink your line into a single filling machine in an isolator or a RABS. With RTU quantity discounts and the millions of dollars in capital expenses saved, the site economics can radically shift to being a low-cost center. The tunnels and support gear typically can be 50 percent of the line capital spend. Build and operate the isolator in an EU grade D space. Although this sounds radical and noncompliant, many organizations have passed EU and FDA inspections by validating and proving the capability of the isolator in a grade D suite. Grade D space costs between $500 and $600 per square foot to build and below $100 per square foot per year in power costs. It is critical to rethink how any piece of equipment fits into your plant and to optimize it and the use of the space. Contact a local architect for suggestions; the savings may be well worth the effort. The concept of the “traditional filling lines” should probably be changed to “marginally compliant lines,” as this carefully worded concept means the filling does not take place in a RABS or an isolator. We have seen projects where the autoclaves, tunnels, washers, and various support equipment are being upgraded to support a filler that is enclosed in flexible plastic curtains, partial enclosures, laminar flow hoods, and various marginally compliant "enclosures." All the operating company is doing is adding more capital dollars to a risky compliance and reliability situation. It is not atypical to see projects add capacity to the line with new support equipment, but the operational efficiency of the line degrades or was initially so poor no overall capacity is gained. This approach will force the plant to maintain the filling system in a high-cost environment. From an overall business view, this is a very short-term solution, as the costs and risks will place that facility in an untenable position. CMOs typically follow this model, which is why these sites change ownership frequently. One of the most intriguing parts of our business is the aseptic filling sites that formulate in one room (EU grade C, hopefully) and fill in another, typically 10 to 20 feet away, and roll a 100- to 1,000-liter tank through airlocks and rooms into the fill suite (EU grade B). The act of rolling any large vessel carries an immense surface area with particulates and wheels that pick up additional particulates from floors and shed them through travels. In addition, we really can’t clean the exterior of the vessel, as the act of wiping it down creates particles. With tubing systems and single-use disposable connectors, liquids can be pumped from room to room and bag to bag with little difficulty. Pallet tanks/jacketed pallet tanks can be stationed where the user needs them, and fluids can be pumped from point to point. The pallet tanks can be placed on the newest ultra-thin floor scales with accurate readouts and interfaces to systems. The old excuse of tubing incompatibility no longer holds true, as there are many bag and tubing compositions, some that are identical to the IV bag and hospital tubing sets used for the products’ delivery. There is the some apparent “magic” around the stainless steel tubing for tank-to-filler connections. These inflexible vestiges of yesteryear still adorn the racks of CMO facilities as dedicated delivery systems which have to be fabricated, cleaned, sterilized, and fitted in place. All this adds cost, time, and complexity. With single-use systems and tubing and disposable filling needles, there is no need to complicate the filling-liquid delivery for most products. The filling machine can be easily connected to the product bag with one of many aseptic connectors. After the fill is done, the product bag, tubing, filters, and filling needles are removed and discarded with no cleaning or sterilizing, leading to significant time savings for the preparation of the next batch. Single-use/disposables are the way to re-engineer your product delivery. Similar to the product delivery systems discussed above, we still have a propensity to use stainless steel filter housings. Have you seen the average filter housing today? It looks like it has been used as a battering ram, with scratches, gouges, and the occasional rouging. Single-use 0.2 micron, sterilized disposable filters are available in the same polymer compositions as the traditional. The single-use filters can be custom-built with any tubing and routing, sterilized, and double-bagged. This would save time, cleaning, labor cost, and effort. Maybe it is time to put some of our old stainless steel friends to rest? Also, consider that with the reduced need for washing stainless steel spool pieces and filters, wash areas can be reduced in size or eliminated, gaining valuable space for real improvements. The most prolific problem we have seen over the last few years involves the confusion of what gowning rooms and airlocks should be. Gowning rooms that are also airlocks must be unidirectional, so workers/operators exiting from one line do not contaminate the freshly gowned operators going into the Grade C or B environment. Why is this a difficult concept? We have seen three operators leaving and three operators coming on shift in the same airlock at the same time. Should that not sound an alarm in terms of quality? Secondly, personnel and material airlocks have become the new storage rooms for buckets, mops, filling system spare parts, dirty equipment, clean equipment, HEPA vacuums, peristaltic pumps, pallet tanks, etc. These airlocks retain these items day in and day out, and, depending on which side of the “magical yellow line” they're on, these may be clean or dirty. Airlocks are for transition from grade to grade and not a place to store equipment — clean equipment gathers particulates from the stampede of gowning, and dirty equipment could contaminate personnel passing through. Change parts sitting in unsecured in bins in the material airlock can lead to incorrect setups on the line. Airlocks are for one-way transition of personnel and equipment or material and are not your closet. Our objective in the modern facility is to eliminate cleaning and sterilization of any vessel because of the production time, cost, and risk; however, we see this is the lifeblood of many CMOs. 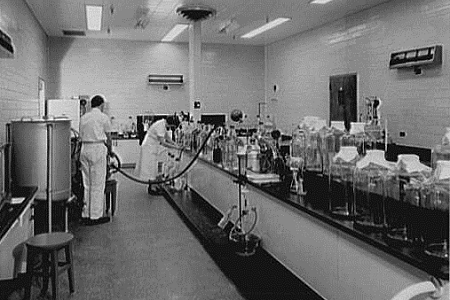 In many aseptic facilities, and especially at CMOs, the validation organization is the largest department because of the many aspects we have mentioned above; plus, it is a revenue stream for a CMO. However, it does not add real value to clients and only adds costs and extends the timeline. As we expand, transfer, and build our product portfolios, we need to ask ourselves why we are not using disposables in our product pathways. Cleaning studies, which include protocols, swabbing, clean-in-place development runs, testing, inspections, challenge runs, etc., typically delay a project by six months. From a cost and time-to-market perspective, disposables can have a profound impact on your production schedule and market introduction. Factory acceptance testing (FAT) — The equipment for the new line is checked (inspections, operational readiness, tests, and trials with placebo) and challenged at the site of a vendor in Germany or Italy with the objective of paying the vendor and enjoying a European trip on the company. Site acceptance testing (SAT) — When the equipment is installed at the operational site, the entire routine is repeated so we can pay the vendors’ final invoice, and we inspect and verify all the installation and operation so we can be ready for validation. Installation qualification (IQ) — We re-perform all the installation tests and assembly tests that were done, but not documented, previously. Operational qualification (OQ) — Again, we re-perform all the run tests. These organizations essentially are executing the IQ and OQ testing three times and filling in the equivalent of an old-fashioned telephone book with useless data. The QA organization has their favorite on-site validation contractor, and they let that part of the project go on autopilot. They do this because, “It is the company standard,” “We have always done it this way,” and “We have established protocols our company and the clients want to see.” This is the easy way out! Most CMO clients have never seen your CMO protocols and don’t want the baggage. This is 1990s validation, where undirected protocol development creates volumes of apparent work. Performance qualification (PQ) — We execute a battery of tests, some which are valuable and some only to test the limits of the machine, even over the objections of the vendor! As an example, one CMO ran the filler down past the low alarm and then the low/stop where the filler is designed to shut down. This was done to explore the fill-weight stability until empty. In real operation that can never happen and was a waste of time and money. The reason was, “That is the company standard.” How can a company standard be to run a machine in a manner the vendor does not intend it to run nor guarantee? The concept of commissioning has been around for many years, along with the development of risk-based qualification. In 2019, we need to embrace risk-based qualification and true business justification for the testing we perform. Secondly, we should execute and collect this data for the qualification from the FAT or SAT and not repeat it. Cost and time to market are our objectives, and we have the means to accomplish them. Management wants you to use capital efficiently. We shouldn't look at validation as a hurdle but as an opportunity. Lines that are skating by with multiple deviations and justifications during validation will have operational efficiency issues. Solving these problems up front using new technologies will make validation easier, and you will improve the line’s uptime and, therefore, capacity. Why Do We Work Like We Did In The 1990s? We don’t have time to change. Change always costs money and time. Someone else won’t accept the change. We are just patching up the facility and providing minor unvalidated modifications. These are often infamous last words which provide an escape clause to not update drawings and to execute sloppy, and, in hindsight, irresponsible engineering. One organization ran rubber hose in the interstitial space above the filling line to move water in a temperature control unit (TCU) loop. The result was a burst hose, rebuilding a filling room, and loss of the filling line for months. Regulators want you to change and have published guidance documents stating such. We don’t change because we live in a mindset not to change. We assume we need to freeze everything because it is in a validated state. A new project is a perfect time to build and validate a new compliance milestone for a facility. The pressure to perform and make good on timelines and budgets coupled with an overwhelming volume of work for a fixed staff has forced some sites to stop learning and improving. Taking advantage of technology (disposables and machines), techniques (risk-based and operational awareness), and responsible engineering is an investment in compliance, capacity, and longevity of the site. Technology assessment — What is the best available technology? Facility assessment — What is the best way to engineer and build the equipment into the facility? Budget — What are the capital and operating costs, and how can we reduce either? Timeline/schedule – What technique or technology can improve the implementation time? We have many ways to save time, increase compliance, and reduce cost simply by looking at what the best organizations do and what the best vendors deliver. We can do this by visiting trade shows and conferences and taking a hard look at the industry’s best practices. In some cases ,we need to refocus Grandma’s aseptic approach! Herman F. Bozenhardt has 43 years of experience in pharmaceutical, biotechnology, and medical device manufacturing, engineering, and compliance. He is a recognized expert in aseptic filling facilities and systems and has extensive experience in the manufacture of therapeutic biologicals and vaccines. His current consulting work focuses on aseptic systems, liposomes, biological manufacturing (BL-1, BL-2, BL-3), and automation/computer systems. He has a bachelor’s of science in chemical engineering and a master’s of science in system engineering, both from the Polytechnic Institute of Brooklyn. He can be reached via email at hermanbozenhardt@gmail.com and on LinkedIn. Erich H. Bozenhardt is the process manager for Integrated Project Services’ process group in Raleigh, North Carolina. He has 12 years of experience in the biotechnology and aseptic processing business and has led several biological manufacturing projects, including cell therapies, mammalian cell culture, and novel delivery systems. He has a bachelor’s of science in chemical engineering and an MBA, both from the University of Delaware. He can be reached at via email at ebozenhardt@ipsdb.com and on LinkedIn.